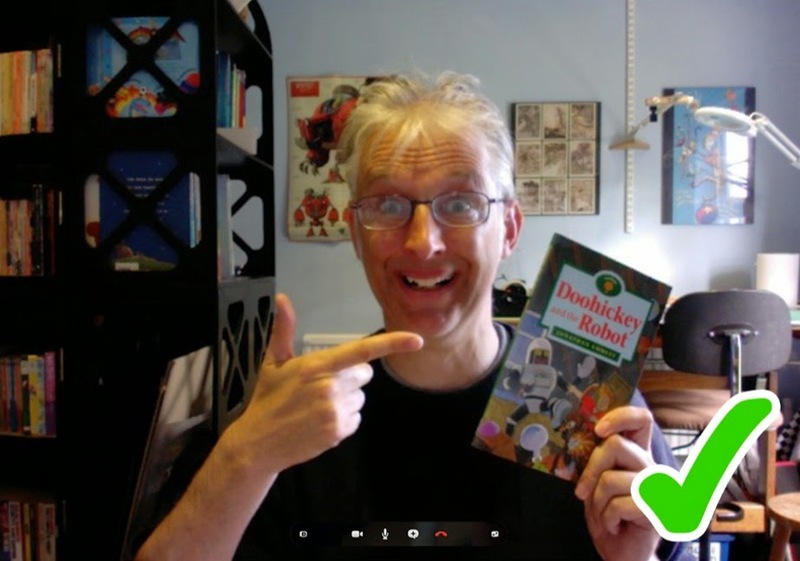 Really helpful, Jonathan, thanks - I've done a couple of Skype visits (UK-Canada), and realise that before I do more I need to set the parameters clearly - as you have done- so that the unpaid Skype visit to a class doesn't replace a paid author visit (not necessarily by me) to a school. What I found a bit freaky, was looking at the back of children's heads - the teacher's webcam was at the back of the class, but I was projected onto a screen at the front and the children were looking towards that so I could only see their faces on the classroom screen. Yes, if you are going to offer free visits, it is important to set parameters and keep to them. I’d read that US author Kate Messner who runs one of the US sites I referred to “typically dedicates one day a week to doing seven or eight free 15-minute Skypes” (http://bit.ly/1q61gjp). I decided I was only prepared to do an hour a week at most (on an unpaid basis). So I do a maximum of two 20 minute visits per week, only on Wedensdays and I limit schools to one visit per school per term. However experience has shown me that short free visits are an effective way for authors to reach schools that, for one reason or another (usually lack of finances), never book real author visits, as well as whet the appetite of other schools to have a real author visit. One of the requirements I list on the virtual visits page of my site is that “The web-cam should be next to the screen if possible, so that I can see the children's faces looking towards me.” On the one occasion the school hadn’t done this, I asked them to move it before the session began as I don’t think it’s possible to have a proper rapport with the children without seeing their faces. Thanks, Jonathan, good tip, I'll be drawing up a list of requirements, too. Oh the places technology will take us! Now, no kids should be without access to author visits to enhance their love of reading and fire up their enthusiasm for story. Thanks, Jonathan, for a really practical and insightful post! Virtual visits have certainly taken me to places that my regular visits cannot reach. I had a lovely virtual visit with a small school on a Native American Reservation last year – there's not too many of those in the East Midlands! Thanks for all this excellent advice, Jonathan. I did a couple of Skype sessions with US schools a few years ago, and I'm hoping to get our Skype connection sorted out so that I can do it again. Your advice will be really helpful. There are indeed advantages to being in your own home. Last time the teacher thoroughly enjoyed having a tour of our kitchen and dining room and the children were able to meet our cat. You're clearly a very adventurous Skyper, Ann! I haven't taken virtual visitors any further than my office yet, but I keep thinking I ought to. We have a big clockwork dragon sculpture in our garden that was inspired by one of my picture books (you can see some photos here http://bit.ly/Z5wpsK). It would be great to read the story with this as a backdrop – weather permitting! Fantastic! Thanks so much Jonathan. I haven't done this as yet, but I get regular emails from children abroad and I like interacting with them. I'll be reading this carefully and then thinking about taking the plunge. 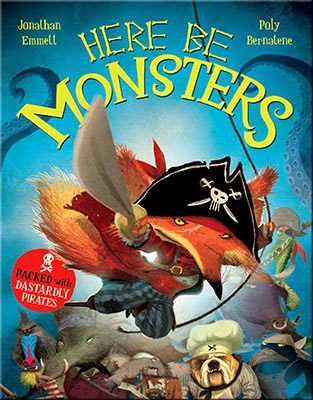 A really useful introduction and guide to an excellent way to make easy contact with lots of interested children. Thank you so much, Jonathan. I must get myself organised! 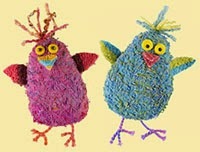 Go for it, Moira and Pippa! You're very welcome, Tammi. Just checked out your site - it looks like you have some great books to Skype with. It sounds rather scary and complicated to somebody who doesn't already Skype, but I'm sure that once I have a PC or laptop with a webcam (yes, that would help!) and then experiment, it would all become less daunting. So now I have another bit of technology I need to learn. Can my wee brain take it? Hope so! And I know whom to ask if I get stuck! Thanks for a very useful blog, Jonathan. I'm sure your "wee brain" can take it, Paeony! However I'd definitely recommend using Skype a few times (to call friends or family) to familiarise yourself with how the software works before using it for school visits. What a great idea. I shall have to look into it all. Would my iPad be good quality enough do you think? It's really well set up for skype stuff with it's front and rear facing camera and all. . .
An iPad is great for Skyping (I sometimes use mine) and has the added advantage of being easy to carry around should you want to give classes a guided tour of your house! If you check out the 'Skype an Author Network' US directory (http://skypeanauthor.wikifoundry.com), you'll find lots of authors offering paid for visits. Many authors offer short (15 mins) visits for free, but charge for longer, more in depth sessions. Thanks, Jonathan. That's really interesting. I've done a couple to the US and they've been really interesting. One thing we did was when the children had a question, they came up to the camera and said their name and then asked their question. Otherwise, it was really difficult to hear from the back of a classroom. Would you do paid skype visits, where you try and do more what you'd do on a paid school visit? My two visits were probably an hour long each, and went really well but there was a lot of organisation involved. I love the idea of getting to some really remote places but I do worry slightly whether it encourages schools to get an awful lot out of very poorly paid authors... With a free author site, as you mentioned in the US, could a school have a skype chat with a different author every week? It sounds amazing for the school but it's that old thorny issue of changing their expectations of what authors' time is worth... I'm just raising this as an issue as it's one that comes up time and again on author sites... Very interesting! 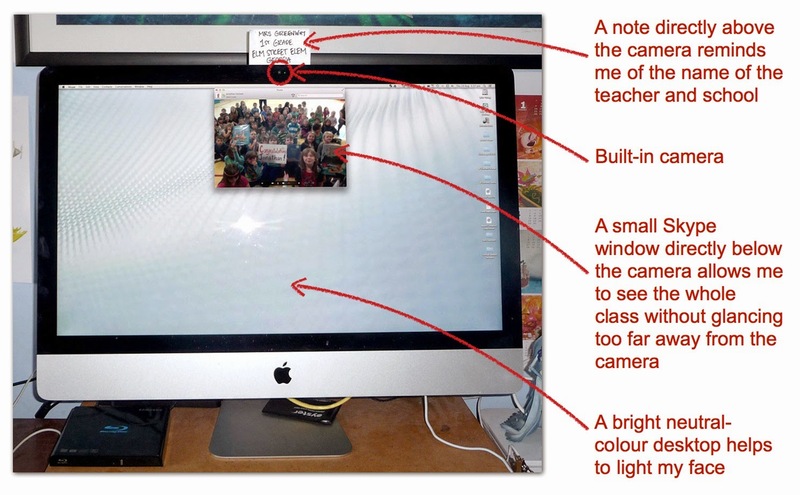 Most of the time I can hear children’s questions from where they’re sitting in the classroom, but sometimes teachers have had to repeat them for me, so I may give your suggestion of having them come up to the camera a try. Children do come up to the camera when they have something to show me or read to me. I don’t offer any paid virtual visits at the moment and I currently have no plans to. One reason I like doing free 20 minute visits is because they are quick and easy and I don’t feel under any obligation to give value for money. 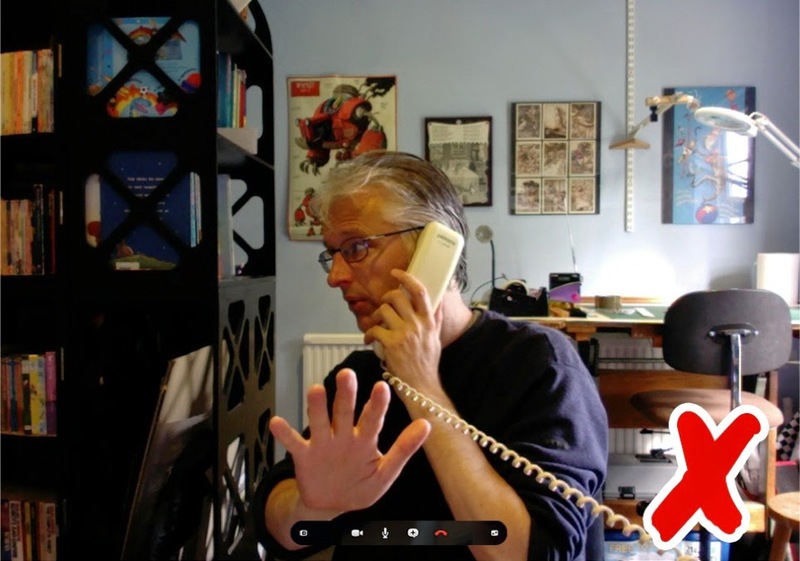 The lack of payment, even for 20 minute Skype visits, does seem to be a sticking point for some UK authors. I ALWAYS charge for my actual school visits and have recently put up my fees. 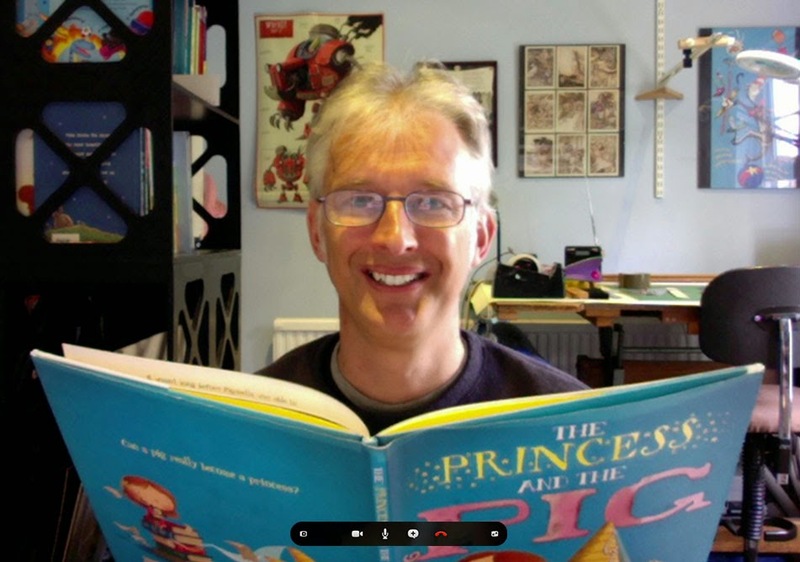 Shortly before I did my first Skype visit I had an awkward conversation with a publicist who asked me to do some free school visits to promote a particular book. I refused as a matter of principal, but felt a bit of an ogre for doing so as the publicist had put a lot of effort into promoting the book (arranging radio interviews and festival events). 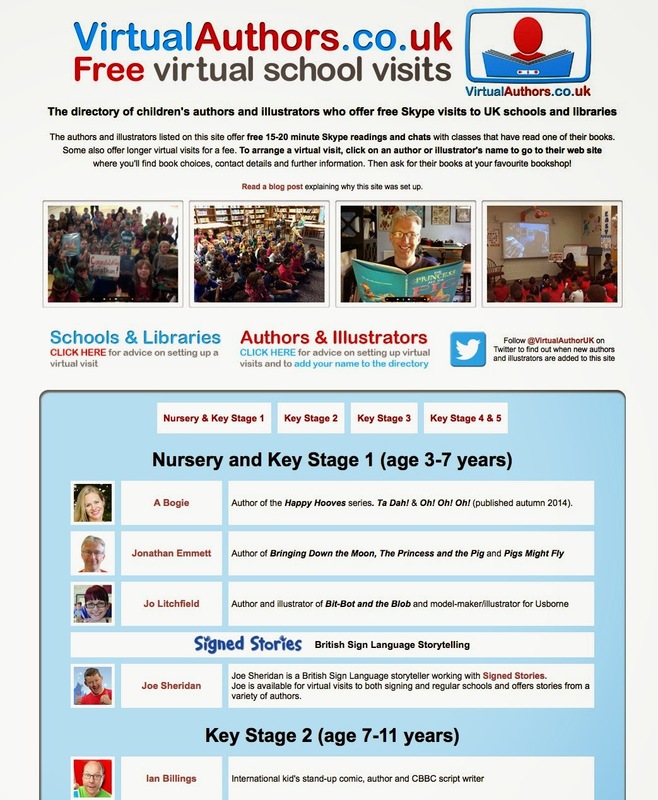 When the first US school got in touch to request a Skype visit I did a little research into fees and discovered that many US authors offered short Skype visits for free. Given that they took so little time, I decided that this was one type of school visit that I was prepared to offer for free. I think it’s a question of striking a sensible balance. Most authors are prepared to give a little of their time for free occasionally (neither you or I are payed to write posts for this blog) if it’s something they enjoy doing and I’ve had some very rewarding responses from schools. Since writing this post I’ve written another post for my own blog (bit.ly/1nZh5JH) about a US school that set up a fan site after one of my virtual visits. Thanks for your really helpful reply, Jonathan. I agree it's about striking a sensible balance. 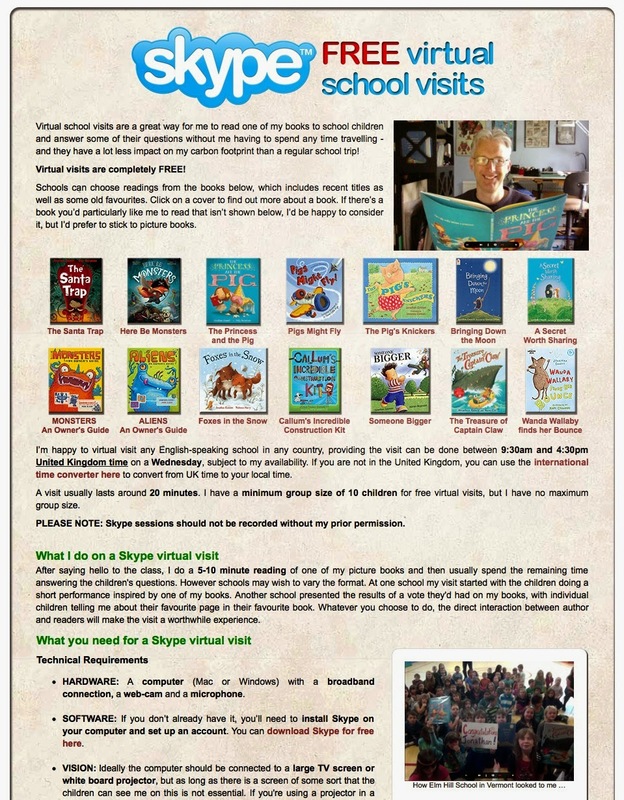 I don't do school visits free either -except ones relating to my children's school and I've done loads of free work relating to reading and writing there. I've also got a grant to engage hard to engage children in reading for pleasure and my matched funding was got by basically being unpaid for about 90% of the work I did for it! I do do some other stuff unpaid (relating to libraries) but as someone who earns considerably less than the minimum wage -as is the case with many other authors, I've got to learn to be really sensible with my time. I think there's a problem of people not realising how little money most authors earn. I do think it's a really interesting subject and I love that skype has made this possible. Thanks for all the tips. I certainly had to play around with lighting (though I didn't ever look quite as green as you in that picture -but possibly as scary!). Thanks, Clare.